Place: Yeshe Sal Ling, Kurweg 2, 8061 St. Radegund bei Graz, Austria - directions here. Cost of teachings: Euro 90 for expenses. In addition, donations to Khen Rinpoche are, as always, a good idea. Khenpo Tenpa Yungdrung Rinpoche, the learned abbot of Triten Norbutse monastery, gives teachings on the essential mantra OM MA TRI MU YE SA LE DU in Yeshe Sal Ling on the weekend April 27-28, 2019. 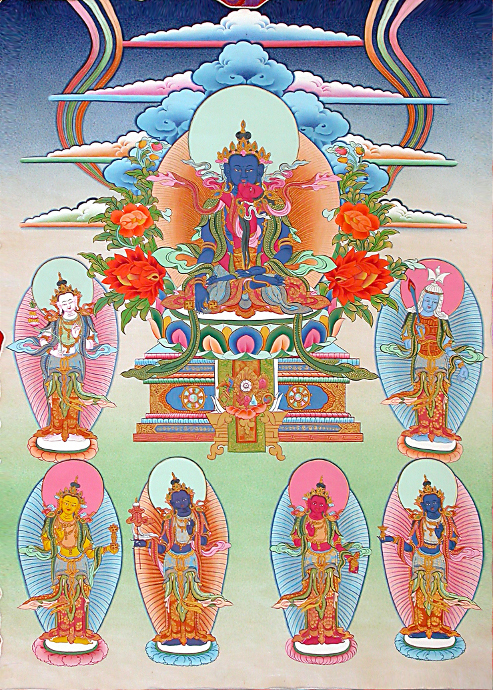 Khenpo Tenpa Rinpoche will teach the meanings of the individual syllables of this essential mantra, and their correspondence to the guiding Buddhas of the six realms, and their liberating actions. As for practices, Khen Rinpoche will teach a practice combining visualization with recitation of the mantra, and a more comprehensive recitation practice including the praise of the mantra. Finally, there are beautiful melodies to which this essential mantra can be chanted. We will learn and practice several different ones. Khen Rinpoche will arrive in Yeshe Sal Ling April 25 and depart April 30. April 26 and 29 there will be time for informal interaction with Khenpo, perhaps going for a walk in the woods with him, and for private consultations. Prerequisites: New students are welcome to join - there are no formal prerequisites.